*When I arrived at work this morning, there was a special little basket full of goodies from that awesome senior Rylee Marie Noto. I am really going to miss her when she moves to Oklahoma at the end of the summer. *This morning representatives from NIC came over again to help the last of our seniors get signed up for classes. This has been awesome this year, having all of the help from NIC. And they told me that our seniors numbers of being admitted and enrolled far surpass any other school they have been working with in North Idaho. Our students are prepared and ready to go to college!! *I remembered that today was the Senior Health Fair in Pinehurst, where I received my blood test results that were drawn last week. I got there just as things were ending. But I think my results are looking good. *The afternoon was spend sprucing up the grounds of KHS for graduation on Saturday. 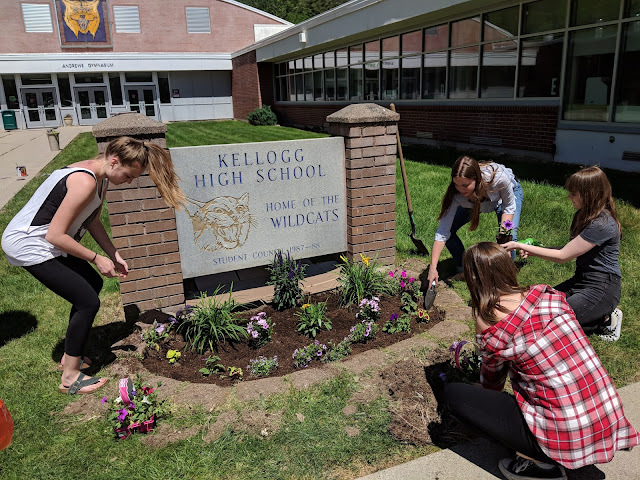 Some NHS members and KHS United members walked around and picked up trash, planted flowers and repainted paw prints on the sidewalk. It is going to look really nice for Saturday. *The doorbell rang a little before dinnertime, and it was Brian White, the guy who is going to cut down our tree. He had lost Paul’s phone number, so decided to stop by and set up a time to cut it down. So our big, beautiful, unhealthy birch tree will be coming down on Friday. No, it is not our beautiful tri-color beech tree, that is close to the house. *I spent the afternoon and evening writing notes to each of the seniors to give to them at their breakfast in the morning.